TS DEECET 2019 Online Application Date Extended upto 15-04-19.Edit Option Will be Available from 17-04-19 to 18-04-19. Government of Telangana Commissioner and Directior of School Education and Convenor Of DEECET 2019 Released DEECET 2019 notification on 08-03-2019 For Admission In D.El.Ed/D.Ed (Diploma in Elementary Education/ Diploma in Eduaction) two year course Diploma in Elementary Education Common Entrance Test Generally Called DEECET/ DIETCET. TS DEECET 2019 Notification Released For Admission into Two Year D.El.Ed/D.Ed/TTC Course nd Diploma in Pre School Education (D.P.S.E) For The year 2019-2021 on 08-03-2019. After writing DEECET 2019 You can Take admission into Govt DIETS(District Institute Of Education And Training)/ Private DIETS in Telangana State. Interested Candidates who completed their Intermediate Can Apply Online For DEECET-2019 From 11-03-2019 to 15-04-2019 From Official Website www.deecet.cdse.telangana.gov.in Application Should be Apply Online Only. The Exam will be conducted in CBT (Computer Based Test) Mode.Exam Will be conducted on 22 may 2019. Online application for TS DEECET - 2019 are invited from candidates who intend to take admission into two years Diploma in Elementary Education (D.EL.Ed) in Government District Institutes of Education & Training (DIETs) and Private Elementary Teacher Training Institutions in the state to be conducted by Dept. of School Education. 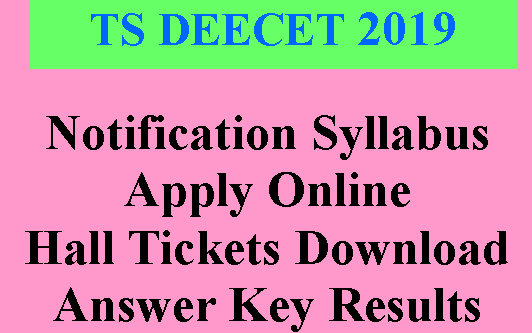 All Details Of DEECET 2019 of Online Applications, Apply Online Exam Dates , Syllabus, Pattern Of Examinations , Eligibility, Results Are as Follows. Online applications for appearing at the Telangana State Diploma in Elementary Education Common entrance Test (TSDEECET – 2019) to be conducted by Dept. of School Education, Govt of Telangana shortly, are invited from eligible candidates who intend to take admission into two years Diploma in Elementary Education (D.EL.Ed) and Diploma in Pre School Education (D.P.S.E) in Government District Institutes of Education & Training (DIETs) and Private Elementary Teacher Training Institutions in the state.Through Computer Based (CBT) Onlin mode only For the Year 2019-2021. Fee and submission of Application Online : The fee prescribed for appearing for TS DEECET 2019 to be conducted online is Rs.413/- (Rupees Four Hundred and Thirteen Only). Candidates can pay the fee through payment Gateway between 10.03-2019 to 04-04-2019 and submit online application at the TS DEECET website http://deecet.cdse.telangana.gov.in/ between 11.03-2019 to 04-04-2019. Procedure for submission of application online: Detailed procedure for applying ONLINE is given in the Information Bulletin. Candidates can download the “Information Bulletin” free of cost from the TS DEECET website www.deecet.cdse/telangana.gov.in/ from 10.03.2019 onwards. Candidates can submit their applications online from 11.03.2019 to 15.04.2019. Examination centres for TS DEECET 2019: DEECET shall be conducted "ONLINE" in all the 10 erstwhile districts of the state. 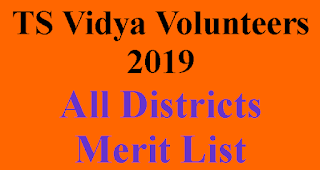 The candidates should satisfy the Local / Non Local status requirements as laid down in the Telangana Educational Institutions (Regulation of Admission) Order, 1974 as amended from time to time. Candidates should have secured a rank in TS DEECET 2019 and should satisfy the educational qualifications as shown at 5 (D) below for allotment of Seats in Government DIETs and Category ‘A’ and ‘B’ seats in Private Elementary Teacher Education Institutions. For obtaining a rank, candidate belonging to “OC” and “BC” Communities shall secure 35% marks in TS DEECET. For Scheduled Castes and Scheduled Tribes there shall be no minimum qualifying marks for allotment of seats reserved under the respective categories. That is to say, candidates belonging to Scheduled Castes and Scheduled Tribes Communities should secure 35% of marks for consideration against seats under OC/ NCC / Defence Personnel or their children and spouses / Sports category. a. The candidate should have passed or appeared for the Intermediate Examination (Qualifying Exam) or its equivalent as decided by the TS DEECET Committee for appearing at the TS DEECET 2019. However, she / he should have passed the qualifying examination by the time of admission. b.The candidates should have secured 50% of marks in aggregate in the Qualifying Examination for appearing at the TS DEECET 2019. The minimum percentage of marks in the case of Scheduled Castes and Scheduled Tribes and Physically Challenged candidates shall however be 45%. Age : Candidates should have completed 17 years of age as on 1st September of the year of admission. There shall be no upper age limit for admission into D.El.Ed /DPSE Programme. NOTE: The Candidates Who Passed Intermediate with Voctional Coures(s) are Not Eligible. Rule of Reservation and allotment of Seats The details pertaining to the Rule of Reservation and allotment of seats are given in the Information Bulletin. 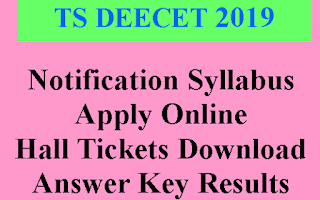 Syllabus and Structure of the test Syllabus and Structure of the test are given in the Information Bulletin hosted on TS DEECET website http://deecet.cdse.telangana.gov.in/. Method of conduct of TS DEECET 2019 TS DEECET 2017 shall be conducted ‘ONLINE’. Detailed procedure shall be hosted on the TS DEECET website http://deecet.cdse.telangana.gov.in/ shortly. Storage of Examination material: The Online Examination related material will be preserved for six months from the date of Examination and no application in this regard will be entertained beyond this period. (1) TS DEECET 2019 is a common Entrance Test For admission into both D.El.Ed and DPSE. (2)DPSE Programme is offered only in English Medium. Therefor Candidates Appearing for TS DEECET 2019 in English Medium will Only have option to seek admission in DPSE along with D.El.Ed. (2) The admissions into all Government DIETs, Government Elementary Teacher Education Institutions and Category ‘A’ seats of the Private Unaided Elementary Teacher Education Institutions shall be made through a Single Window System in the order of merit on the basis of medium-wise rank assigned in TS DEECET 2019 and to the extent of sanctioned seats through Web Based Admission Service provided by the Convener TS DEECET 2019 or Convener TS DEECET AC 2019 as the case may be. (2) Medium of D.El.Ed. course: The candidates opting for any particular medium (Telugu / English / Urdu) shall exercise their option in the online application for appearing for TS DEECET 2019 and the Test Paper for TS DEECET 2019 shall be in that particular Medium only. (b) All the Category ‘B’ seats shall be filled by the respective Institutions with the eligible candidates as given at 5 above. Admissions under Category ‘B’ shall be done duly following the procedure laid down in Rule 6 (V) of G.O.Ms.No.10 SCHOOL EDUCATION (Prog.II) DEPARTMENT Dt.12.04.2017 and G.O.Ms.No.8 SCHOOL EDUCATION (Prog.II) DEPARTMENT Dt.28.03.2018. (c) The Admission of the candidate made in Private Un-aided Non-Minority / Private Un-aided Minority (Under Single Window 1 and 2) Elementary Teacher Education Institutions under Category ‘B’ shall be subject to approval by the Convener TS DEECET 2019. The test paper shall be of objective type in three Parts as shown below with 100 questions and with each question carrying 1 mark. (a) TS DEECET 2019 shall be conducted ‘ONLINE’, as per the medium opted by the candidate, in multiple sessions on the dates to be notified shortly. (b) of the Question Paper shall be either Telugu or Urdu as opted by the candidate in the online application. (d) The Question paper Medium shall be the same as the Medium of D.El.Ed. opted for. (e) The candidates who obtain qualifying marks as given at 5 (C) above shall only be assigned ranks as per order of merit. 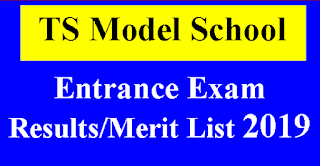 In case of SC and ST all the candidates shall be assigned rank as per the order of merit. (f) TS DEECET 2019 is conducted ‘ONLINE’. Hence, requests for re-access, re-totaling and re-valuation of the question paper will not be entertained. (g) Instructions regarding modalities of online exam and Model Question Paper for practice by the candidates shall be made available on the website http://deecet.cdse.telangana.gov.in. shortly. Candidates may download their Hall Tickets online from http://deecet.cdse.telangana.gov.in from the dates to be notified on the website. Candidates may keep viewing the website for information on dates of download of Hall Tickets. In case any candidate cannot download the Hall ticket during the dates notified for download of Hall Tickets, she/he should contact the help line by giving the details of the Journal Number of the fee paid and the reference ID number of the application submitted.